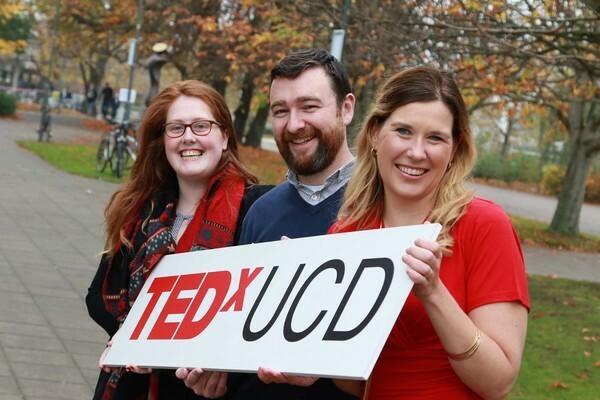 Pictured at University College Dublin (left to right): Amy Fox, a UCD Business and Law student and the MC for TEDxUCD 2015, with Dr Brendan Rooney and Dr Cara Augustenborg, two of the nine TEDxUCD 2015 speakers. TED is returning to UCD! University College Dublin has announced the nine speakers who will be presenting their ideas worth spreading at the third TEDxUCD in December! TED is a non-profit organisation which runs conferences dedicated to spreading interesting and innovative ideas worldwide. These conferences normally consist of a series of talks, covering a massive spectrum of topics, ranging from body language to software, from urban planning to faith. TED supports community-based talks through the TEDx programme, allowing independent groups to create their own events. Dr Brendan Rooney: Controlling emotions: movies and (virtual) reality. For information on the speakers, check out the event’s page on the UCD website. TEDxUCD will be taking place from 11am to 4pm on Friday, December 4 in the UCD Dramasoc Theatre in the UCD Student Centre. 100 free tickets will be available from tomorrow (November 11) at 1.30pm, and can be accessed through the UCD website.